Forestburgh, New York. September 11, 2010. 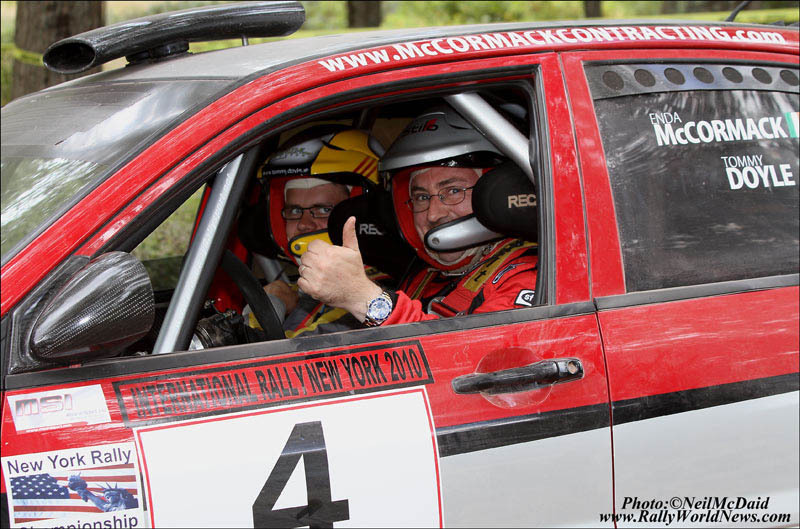 After the completion of the final stage of International Rally New York [IRNY] it seemed that Turkish driver Volkan Isik had taken the overall victory. But it was short lived as several objections were lodged against Isik that he had received illegal assistance from his service crew after SS4. Isik was given a 45 minute penalty, therefore handing Tom Lawless the overall victory. A still struggling economy, overlapping rallies, not enough variation in stages, RallyCross, take your pick, but in the end it may have been a combination of each that impacted the entries for IRNY 2010. Just 14 cars were listed on the start order for day one but late withdrawals by Arek Gruszka and Yogeshwar Gill actually made it only 12 starters. This was the lowest entry in the history of IRNY, and had many questioning if the rally should have gone ahead. Day one got underway with Turkish driver Volkan Isik running first on the road on the all-gravel stages at Keowa Rally Village. IRNY has historically seen its fair share of wet conditions, but this year with a prolonged period of dry weather the crews would face some extreme dust on all the stages. Unfortunately, a puncture would slow Isik on the second running of Mortimer Schiff Long SS2, handing Lawless the stage win by 13 seconds. But we would see the vastly experienced Turkish driver charge back on SS3 taking the stage win and clawing back some of the lost time from Lawless. Danny O’Brien, Enda McCormack and Charlie Donnelly would also lock horns and swap times to round out the top five over the early stages. 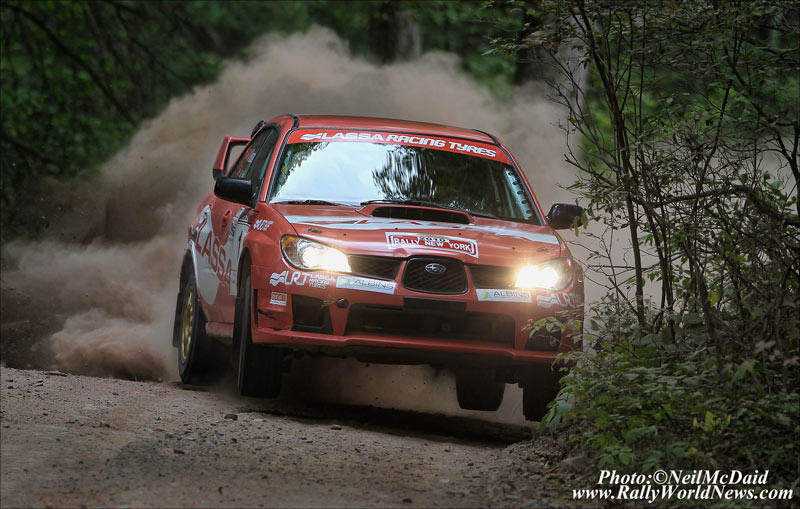 The first three stages of the rally were all 8.5 miles in length with several rough sections that took their toll on the very limited entry. Heading into the first service of the rally several cars were either already stranded on stage or limping into the service area. Michael and John O’Leary crawled through SS2 in their Evo X with a broken front damper after a heavy impact with a rock. They would eventually retire on the transit. Erica Detota had a broken right front axle on SS2 but managed to make some repairs and complete SS3 before getting the issue completely resolved in service. Martin O’Flynn in the Eclipse came to a sudden stop after connecting with his least favorite tree [2nd time off at the same spot]. Both Martin and his co-driver Brian McNamara were ok and they did rejoin the rally later under super-rally rules. 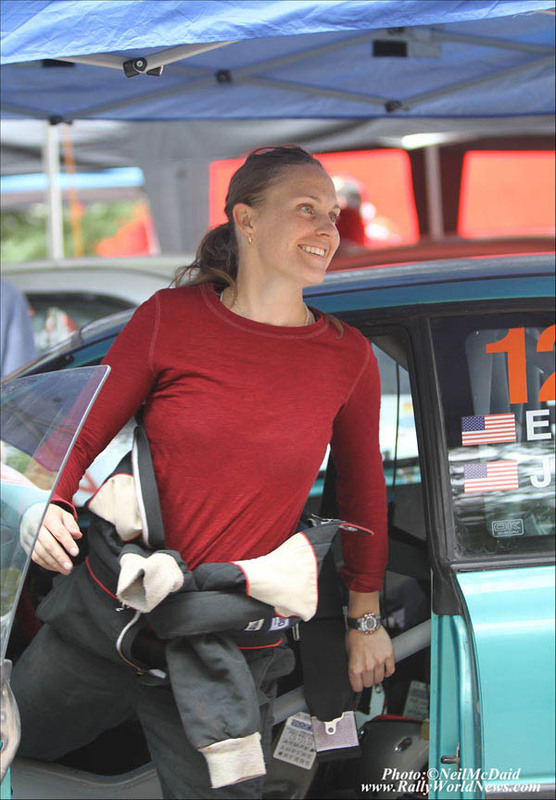 first lady to claim the United States Rally Champion title. 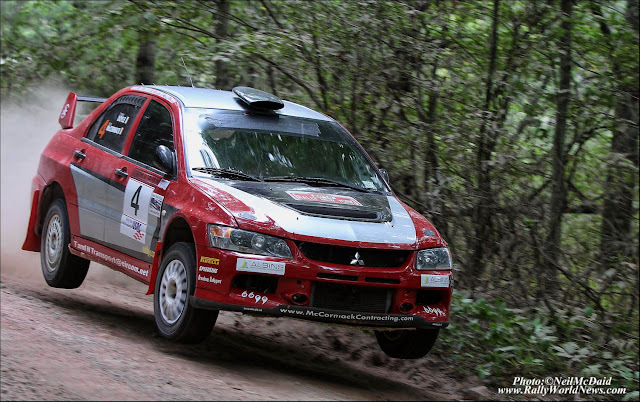 Charlie Donnelly came into service with a very noisy rear diff in his Evo. Under inspection it was determined that a coupling on the rear diff had come loose. Wojtek Al Kulpa also parked his Golf on SS3 after an off when he got caught in a massive dust cloud on the stage. At the starting line of SS4 all hell would break loose. After giving the lead drivers a two minute dust window on the first 3 stages, the organizer directed the stage start control on SS4 to reduce the gap to one minute. This change came as drivers were belted in and ready to go. Several of the lead drivers were livid and very animated; to say the least, as they were not given prior notice of this change, nor had the dust eased any on the stages. Under protest from the drivers and co-drivers, the dust window was eventually extended to three minutes for the last 3 stages on day one. Lawless and Isik would continue their battle throughout the afternoon with only 1 or 2 seconds between their times on most stages. SS8 held drama for Lawless. 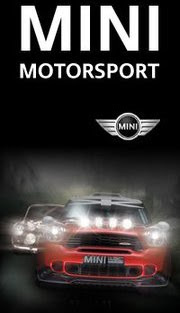 A wrong note resulted in a spin and the loss of reverse gear. Tom would lose over a minute getting back on the road giving back the slight advantage he had on Isik and then some. Lawless would also suffer power steering failure on the last two stages further impeding his progress. with a 45 minute penalty. At the end of day one it was Volkan Isik with a one minute advantage over Tom Lawless in second. Danny O’Brien, Enda McCormack and Charlie Donnelly made up the top five. 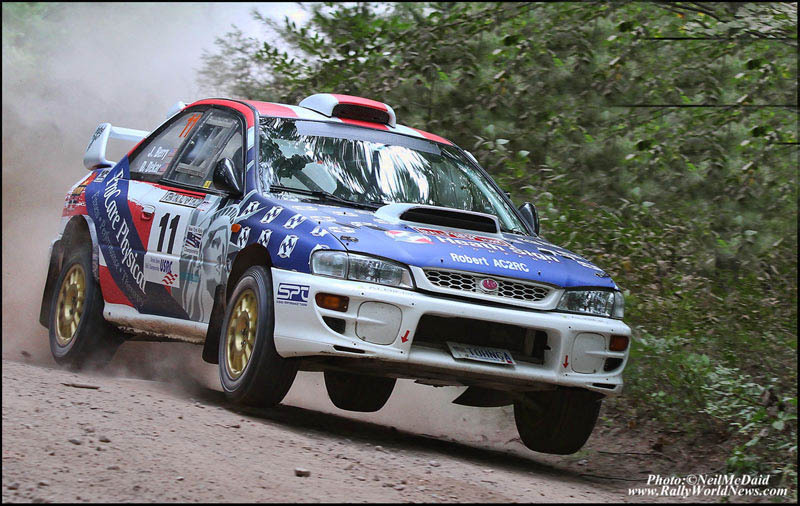 The only lady driver in the rally, Erika Detoda, was holding the lead in 2WD in her Subaru. Day two and we’re back to a 2 minute dust window. The stages are basically the same as day one, with the exception that several are run in reverse. The battle for the lead is no less intense; Lawless was on the attack early looking to make up the time he lost on SS8. He would take the stage victory on SS10, but the Turk would keep the charging Irishman in check nipping Lawless by 2 seconds on SS11. Danny O’Brien’s Subaru and Charlie Donnelly’s Evo with the ailing rear diff would both retire early on day two, this leaving Enda McCormack to focus on a clean run to the podium behind the fierce battle between Isik and Lawless. 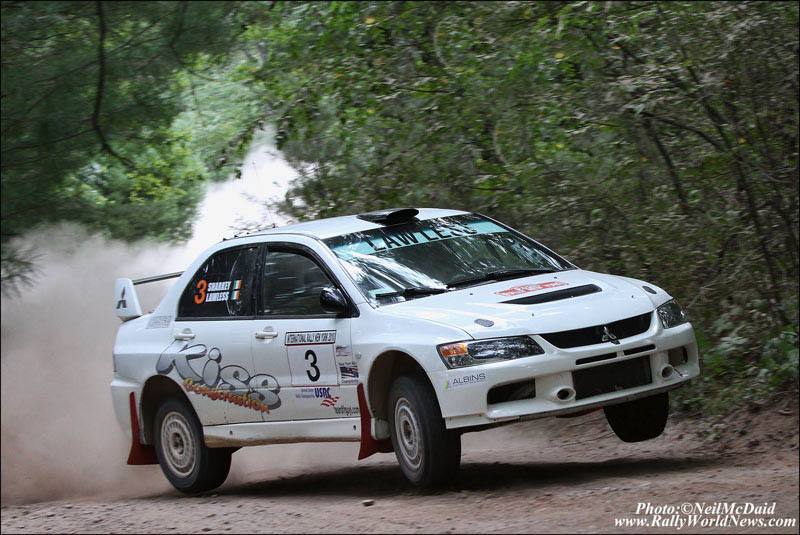 With only two 2WD cars still running, the two top spots on the podium would be between Erika in her Subaru and Tim Oliver in the Dodge Neon. Throughout the afternoon stages of day two, the front runners stayed at it hot and heavy, with Isik setting fastest times on the last four stages of this seventeen stage rally to seal his first US victory. McCormack will not head west in pursuit of the USRC title. 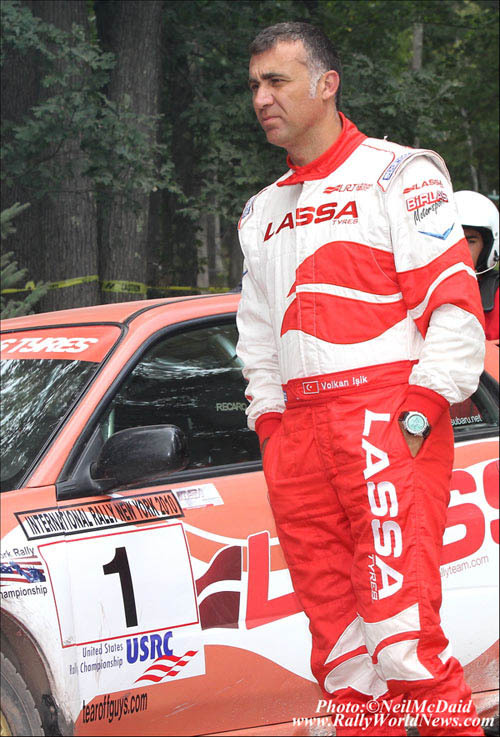 But basking in the dust and glory was short lived for Isik and his Lassa racing team. A rule infraction where he received assistance from his service crew on a transit would have the organizers imposing a 45-minute penalty, pushing Isik back to 8th. Tom Lawless and Brian Sharkey were then awarded the overall win. Slotting into second with a steady trouble free drive was Enda McCormack and Tommy Doyle. And in third, making his first AWD and overall podium appearance, was Derek Dekar and his co-driver Ms. Jessie Berry in an ex-Matt Iorio Subaru. Erika Detoda managed to hold position for her first overall victory in 2WD. It was really sad to see the overall result have to be decided in this way. As we publish this report there are still no official stage times listed for SS4. This was the stage that the dust window was reduced putting all cars behind Isik at a major disadvantage. It is also ironic that it was at the end of SS4 where the illegal service infraction took place. Derek Dekar grabs third overall at IRNY. For the final round of the USRC it is west to Prescott for the East Coast crew. With the victory at International Rally New York, Lawless unofficially leads the point’s race in AWD. Ericka Detota merely needs to start Prescott to claim the USRC 2WD title. From what we understand, Lawless, McCormack and Detota are all planning on heading west in pursuit of the 2010 USRC championship titles in their respective classes.